I have been feeling out of sorts lately and could not really put my finger on it. I was feeling as if I was chasing my tail, going in circles, and getting no where. I was listening to Bob Procter’s “The 11 Forgotten Laws” and knew that I had to start doing things different to get the results I wanted. Then I got an email from a friend and it all started to fall in place. It was exactly what Bob was talking about. I want to share that email with you because as a practicing Astrologer I know that what she was sharing with me is true and it is affecting everyone on planet Earth. Please read it all, it could shed some light, like it did me. Keep your spiritual seatbelt fastened; we are in the midst of another huge wave of accelerated transformation. In addition to the full moon and third grand cross (details below), two Class X solar flares occurred today (the strongest category), with more likely to come this week. Solar flares are massive bursts of charged particles which affect the magnetic field of the Earth and all its inhabitants. These transmissions of light reconfigure our DNA, nervous systems, and consciousness. We are receiving big downloads, which are challenging for both our bodies and our psyches. Spend as much time as possible in nature, meditation, and rest; being ‘rewired’ and reconfigured takes time and energy. The brighter the light, the darker the shadow, so don’t be surprised if you find yourself and/or those around you more easily triggered. If we can stay centered and grounded, a tremendous amount of old program! ming can and will burn off. This is a golden opportunity to make long needed changes and take big steps forward on our path; use it to be fully in your power and in your heart. Solar flares and coronal mass ejections (also known as CMEs, which are much larger eruptions of magnetized particles) occur when two opposing magnetic fields are brought together. This process, called magnetic reconnection, releases the energy stored in those fields. When we are able to balance and integrate opposites in ourselves, we too release a tremendous amount of energy and gain a great deal of light; we become more ‘en – lightened’ — able to hold and shine more light into the world. Geomagnetic storms from solar flares and CMEs not only affect our psyches and bodies, they can disrupt telecommunications, GPS signals, and power grids as well. Make sure important data is backed up. Light from the Sun reaches us in 8 minutes; solar winds carrying highly ionized particles generally take about 72 hours to travel the 93,000,000 miles between our Earth and the Sun, so significant magnetic changes occur three days after a solar flare as well. According to http://www.SpaceWeather.com on June 10: “X-rays and UV radiation from the double flare created a wave of ionization in Earth’s upper atmosphere, altering the normal propagation of radio transmissions over Europe…Solar activity is high, and likely to! remain so in the days ahead.” For more on the current space weather, visit http://www.Science.NASA.gov. 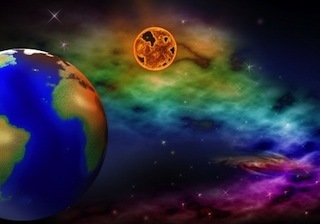 The next full moon, which peaks on Thursday, June 12 at 9:11 PM PDT, illuminates where we still need to make a major change in at least one area of our life. For the last six months, we have been under intense pressure to balance four different areas of our life: self-identity (Aries), relationships (Libra), home (Cancer), and work (Capricorn). The more we have resisted change, the more frustrating and stifling circumstances have become. This full moon coincides with the third of three grand crosses this year involving Mars, Jupiter, Uranus, and Pluto. The first grand cross was highlighted by the Gemini–Sagittarius Full Moon on December 17, 2013, and was in force from approximately mid December to mid January (8°–17°). The second and most compelling grand cross peaked April 20–22, with all four planets at 14° during the height of the fifth Uranus–Pluto square and in between two eclipses (April 15 and April 29). This third grand cross peaks between June 14 and 25 at 13°–23°, again revealing where we need to let go and move forward. During this full moon, Venus’s exact opposition to Saturn (18° Taurus–Scorpio) urges us to honor our values and limits. What challenges were you facing six months ago? What changes do you still need to make? What fears do you need to face? In order to do things differently, we have to see them differently. This full moon peaks with the Sun at 22º Gemini, and the Moon at 22º Sagittarius. Gemini is the sign most concerned with the mind, cognition, and intelligence — how we perceive, process, and share information. Sagittarius deals with our interpretation of that information — our judgments, concepts, and beliefs around what is true, possible, and real. Humanity is evolving from duality to unity, moving from the illusion of separation into the truth of our interconnectedness. Making a dimensional shift is like going from a narrow, deep canyon up to a mountain peak. From a higher perspective, we can see the lay of the land and our place in it; we realize that everything and everyone is part of a much greater landscape. Do what helps you see and keep the big picture in mind – that we are spirit cloaked in matter, on an infinite journey of self discovery, evolving and creating reality with our every thought, word, and deed. Mercury, the traditional ruler of Gemini, is retrograde from June 7 to July 1 (3° Cancer to 24° Gemini), exposing where we need to ‘think different,’ and develop greater emotional intelligence. Communication includes sharing what’s in our heart as well as our head. Much of what we consider to be communication — judging, criticizing, blaming, labeling — promotes separation rather than connection. We may not think of ourselves as violent, but in essence, anything that causes separation is a form of violence. When we have a harsh inner critic, we are being violent to ourselves; when we judge others, that, too, is a subtle form of violence. Nonviolent Communication (NVC), also known as Intentional Communication or Compassionate Communication, offers a simple but profound method of identifying and sharing what’s true on a deeper level for ourselves and others, as well as a way to resolve conflict of all kinds, from partnership and family struggles to international disputes. For more on the power of communication, watch a short, insightful video on NVC at http://www.nvcboston.org. The first solstice of the year occurs on June 21 at 3:51 AM PDT. Solstices have long been recognized by cultures around the world as important turning points, and are especially powerful times for personal and collective shifts. Solstices function as energetic gateways, allowing a greater influx of stellar radiation as the axial tilt of the Earth comes to a gravitational standstill for three days. Because the summer and winter solstices are now also closely aligned with the Galactic Cross — the intersection of the plane of our Milky Way Galaxy with the ecliptic (the path of the Earth around the Sun) — each solstice (and equinox) provides a wider portal for the celestial downloads which are accelerating humanity’s evolution. Solstice energies offer strong tailwinds for healing old issues, as well as empowering what we wish to manifest next. Receive the gifts of this time in meditation, prayer, and community. Visualize and affirm what you wish to bring into the world. Attune to the messages streaming from the galactic core and your higher self. We are primed for yet another quantum leap. If it’s not possible for you to meditate or celebrate at the exact time of the solstice, you can do so at sunrise, noon, sunset, or midnight that day, as those are also power times. Chiron, the archetype of healing the split between spirit and matter, stations retrograde the day before the solstice, adding to the potential for important insights and shifts during this solar gateway. Whatever issues or challenges you may be facing, ask: How is this serving my spiritual growth? What is the lesson, the gift, the message here? Ask for help when necessary; your guides are always on standby. Give thanks to what you are releasing, for the learning and growth it provided. Know that letting go of the old creates space for the new. Remember: “At this time much of what needs to be looked at and cleared is presenting as chaos–things out of sync, relationships no longer working, breakdowns on all levels. When these things happen, go deeper– examine your belief system very honestly dear ones, taking time to sit quietly with paper and pen writing down; “What am I believing that is making me feel this way, experience these things, or to have these difficulties?” Be very, very honest with yourself, for this is not a time to play games and make excuses. After you recognize some belief you are holding, ask yourself, “Is this true or is it simply something I have believed because I was told it was true?” This is work, dear ones because nothing will happen or change without individual effort and intention. There is no one coming with a magic wand, you are your magic wand. Those of you who resonate with these messages are already doing the work, helping to create the new world. « Ear Ache My Eye!